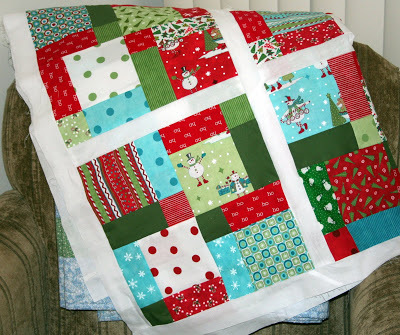 So I’ve finally got the Christmas quilt top done. Except for a blue polka dot border. I was too lazy to take it off the chair, so you get to imagine what the rest of it looks like. :) There are twelve blocks, I can’t remember how big I decided it would be, but it will be a nice size with a 4″border all around. I’ve had a hard time making myself work on this one, some quilts I get so excited about I just HAVE to finish them as fast as possible, and others, like this one get put on the back burner. Maybe its because I’ll be stashing it away for 11 months out of the year? That’s probably it. I really love it now that I can see it put together. I think I sewed the blocks together wrong about twenty times, so my seam ripper and I became very well acquainted…..again. This is so cute! Do you have a pattern for this? I would love to make this!